For years, Maria believed that her youngest daughter Marjorie would never know any independence in her life. She even warned Marjorie’s older brother and sister that they should prepare themselves to take on Marjorie’s care in the future. When Marjorie was at school, Maria found herself constantly worrying about her daughter’s safety. Something had to change…for Maria, for Marjorie and for their family. Marjorie is eleven years old and was diagnosed with an intellectual disability as a young child. In addition, damage to her occipital lobe at age five led to complete blindness when she was just seven years old. Marjorie’s issues led her to act out behaviorally, to the point where Maria and her husband could not take Marjorie out in public. They took turns going to church and the grocery store so that Marjorie would never be home without an adult present. Marjorie’s world was small, and limited to what was already familiar to her. But two years ago, a transformation began - thanks to the Upward for Children and Families program and a very special speech pathologist named Josefa Almanza. Josefa is also blind, and felt a special kinship with Marjorie. Initially, the two worked on speech therapy, but Josefa and Marjorie’s work together soon expanded to include social skills too. Knowing that support at home would be a vital component to Marjorie’s success, Josefa addressed Maria and her fears about Marjorie’s future as well. Josefa began taking Marjorie out, going to as many places as possible. And so, little by little, Marjorie’s world began to grow. Marjorie loves apples, so Josefa took her to the supermarket with the goal of finding an apple among all the fruits and vegetables in the produce section. With each accomplishment, her confidence increased and her behavior improved. “Josefa has been so good for Marjorie,” says Maria. Marjorie also greatly benefited from music therapy at Upward. When she first started, Marjorie was overwhelmed and wore noise cancelling earmuffs most of the time, sitting far away from the instruments. Slowly, Marjorie moved closer and closer, and eventually she shed the earmuffs. One day, Marjorie actually began singing, and is now able to sing most of the songs. Music therapy has helped her to become more verbal and to better acclimate to everyday sounds and noises. Again, Upward helped to enlarge the surroundings in which Marjorie can feel comfortable. Nine months ago, Marjorie began mobility training at Upward. 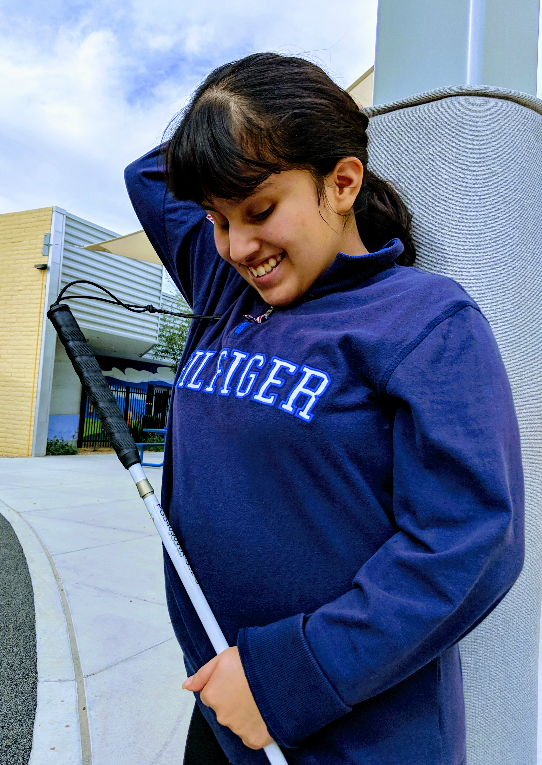 She was a fast learner and now uses a white cane, further showing her independence in the outside world. However, challenges do continue to exist. At home, Maria is tempted to fall back into the exhausting pattern of trying to do everything for her daughter. But with Josefa’s help and encouragement, Maria hopes that the newfound abilities Marjorie exhibits at school will soon spill over into her everyday home environment too. In the meantime, Maria is thrilled with the difference in Marjorie’s personality, especially compared to her behavior prior to Upward. “We can go to people’s houses,” she said. “Marjorie is definitely more lovable and social.” Marjorie is so calm and well-behaved that she and Maria have even been able to go grocery shopping together! Marjorie’s desire to please Josefa has been a strong motivator for her to stay on track. “I feel that she wants to show Josefa that she listens and is able to do what is being asked of her at all times,” says Maria. Consequently, at those times when Marjorie’s behavior at home becomes difficult, Maria reminds her that Josefa would not approve. Marjorie’s success is a reminder that the focus of Upward for Children and Families is embodied in its name. While Marjorie’s treatments are designed to help her directly, the program works because it simultaneously takes the concerns and goals of her entire family into account. Josefa and all of Upward’s passionate, dedicated staff make the world more manageable for children with disabilities, and in doing so they also give much-needed hope and strength to their families.